I think Disney’s 1960 Swiss Family Robinson film, a tale of a shipwrecked family building an island home, which is loosely based on Johann David Wyss’ 1812 novel The Swiss Robinson, is my only association with the subject material, besides a random episode or two of Lost in Space. Also, during the last Disney trip, though this has not been drawn yet, Julie and I explored the Swiss Family Treehouse attraction a bit, though I mostly dealt with a pushy family of three that simply had to get past me on those narrow rope bridges only to stop a few feet ahead, block the path, and stare at stuff. Thank you very much. That all said, I’m here to tell y’all about Friedemann Friese’s Friday, which is a solitaire deck-building card game, which tasks you with optimizing your deck of fight cards to defeat hazards and make it past the pirate ships circling the island. 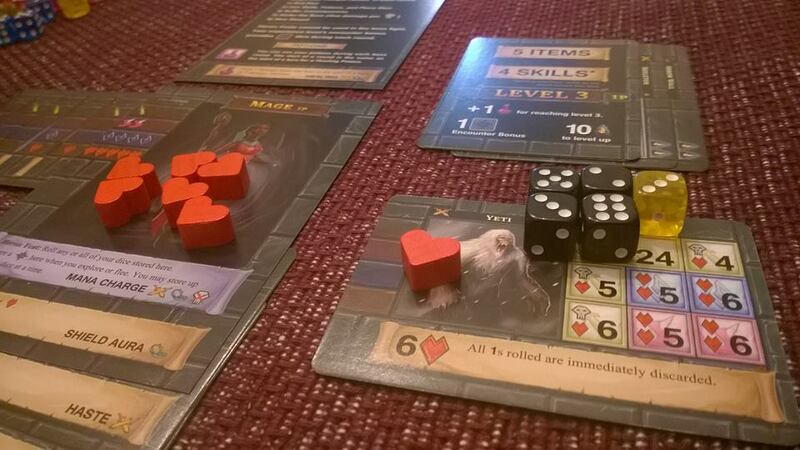 Yes, another solo tabletop game, a specific market niche I’m digging as of late; see my post on Dungeon Roll for more. If the game’s name doesn’t clue you in, you play as island native Friday, not Robinson Crusoe, and your job is basically to babysit the bearded man and ensure he doesn’t do anything stupid and grows stronger in order to better prepare him for the grand escape. This island is your home, and you know it well. Setup is painless and quick, and I was able to fit everything inside a single dinner place-mat. An entire session lasts around fifteen to thirty minutes depending on your actions and how long you spend analyzing the cards you’ve used versus the ones left in your decks. During a turn, Robinson Crusoe will attempt to defeat hazard cards by playing fight cards against them, with the higher number winning. These hazards range from trying to get to a damaged wreck via a raft to exploring the island further to fighting off hungry cannibals. If he is successful, the hazard card will flip and become a fight card; this is now added to your discards of fighting cards and will eventually get shuffled back into the deck. However, if you fail to defeat the hazard, Robinson loses life tokens, represented by what look like tiny wooden green leaves, but also gets the opportunity to remove some of these under-performing cards from the game entirely. There are three phases, each one being more difficult than the previous, and if Friday can keep his island comrade alive long enough, eventually he’ll battle one of the two pirate ships lingering in the ocean. Spoiler alert: after about five or so games, I’ve still not managed to get to the final pirates phase. Grrr. Let’s blame it on Friday’s communication difficulties. The closest I’ve gotten is the third phase, red in color, but cannibals destroyed Robinson Crusoe quickly after he lost too many health points getting there and went home feeling sated. Friday is a game of choices. Sure, there’s luck and randomness involved like in many other card-based games, but it really does come down to issues like pushing forward for more cards at the expensive of life points to get that hazard card as a fight card or losing a fight on purpose to rid yourself of cards like “Distracted (-1)” and “Weak (0)”. I’ve not figured out the perfect strategy, but removing bad cards from the game as early as possible seems obvious though not always easy to do. For one game, Mel kept a sheet of paper and tracked what cards remained in my fighting deck so I’d know whether or not I even had a chance at winning a fight; this is both allowed and encouraged, as the instructions explicitly say that Friday is not a memory game and goes on to list out every card in your arsenal for you to be aware of. One of the things I really like about Friday is its overall footprint. Everything you need to play comes inside a tiny, square box and, as mentioned above, you don’t need a ton of table space to play. The cardboard deck mats are great for organizing where everything goes, and the instructions are pretty clear, though I did have to watch a couple playthroughs on YouTube to fully get how you handle both winning and losing a fight, as some bits weren’t entirely clear. In the end, I’m a fan, and whenever Friday eventually helps Robinson Crusoe sink a pirate ship, I’ll shout it passionately and aggressively from the top of the island for all to hear. As always, I’m all ears for any solo card/board games that you enjoy and therefore think I might too enjoy. Scythe has already been recommended.